In late October 2011, the TransitHub team had the honour of inviting one of our most avid #TransitHubbers, Vipasha Shaikh (@PopsugarJunkie) to one of our Sprint Saturdays for a special visit to watch us in action. Yes, that's right, that's the same Vipasha who shared our first Transit Tale, "Aurora", and who was featured in an episode of "What's Your Hub?". 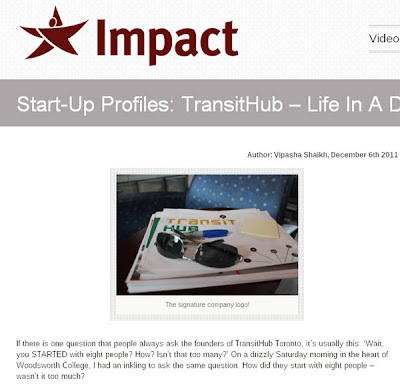 Like any good #TransitHubber, she has continued to spread the transit love by writing a most epic story about her time with us for Impact.org.